A stuck garbage disposal is evident by the loud electrical sound that it makes when you try to turn it on. With the motor unable to turn the disposal it strains to get it moving. Turn it off quickly, you do not want to burn up the motor. Even with the safety switch, this is not good for the motor. Solving this problem should not be too difficult and will not take too long. Unless you have one of those rare situations where a metal item is lodged securely and cannot be removed. This is the exception, not the rule. Usually, it is a couple of minutes with an allen wrench. Take a look at the information below and see if you feel confident trying to perform this repair. Most to the time this is something a homeowner can take care of. What Can You Save? - The serviceman will want to stand around and talk for a few minutes. This keeps you from realizing that it only takes him couple of minutes to free up a jammed garbage disposal. You will have to pay for a service call, $50 to $75. Rarely the disposal will be beyond repair and a new unit could run from $150 to 200 or more for a high end unit. How Hard Could It Be? 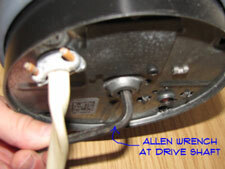 - Most of the time fixing a jammed garbage disposal is not too difficult. These repairs will have a Difficulty Level of: Simple. These repairs require a Skill Level of: Job Jar Specialist. For and explanation of the terms in this section, see 'How to Use This Site'. Check the Simple Things! - As a rule this repair is fairly simple. It is possible to pop the breakers, so check them if the disposal won't come back on. What Can Go Wrong? - You can burn up the motor by repeatedly trying to turn on the switch. The limit switch will trip when the motor gets hot enough. However, you can damage the motor by repeated attempts. Using a garbage disposal wrench is not difficult. It is the best method for freeing up a jammed disposal. 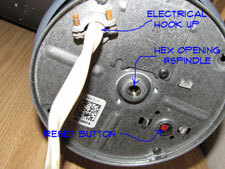 On the bottom of your garbage disposal you will find a hex shaped opening in the center of the housing. this hex opening is attached to the drive shaft. You should have gotten a wrench with your unit that fits here. You know where it is, great, get it. Don't know where it is, bummer. It should take a standard allen wrench. Find one that fits, usually, this will be a 1/4" allen wrench. Before you start working on the disposal you want to turn off the power. Unplug the disposal or shut the breaker off to make sure that no one inadvertently turns the switch on. Put the allen wrench into the socket and try to free up the unit. You may need to worry it back and forth several times to free up the jam. Use the pliers on the allen wrench if you need a little more torque. Keep working with it until the spindle turns freely. If possible you want to remove the object from the disposal before you turn it on. Get a flash light and see if you can figure out where it is. Use tongs, pliers or a magnet to remove the object. No fingers or hands in the disposal, please. With the object removed you can turn the power back on. Try the disposal and make sure it is running freely. Working? Great you have successfully dealt with a jammed garbage disposal. If you keep a journal you may want to make an entry. Removing objects stuck in a disposal will need to be done even after you get it freed up. Disposals will not grind up certain things, so removing them is the best course. Coins and rings are a couple of things that can jam a garbage disposal. They get wedged between the turntable and the side of the housing and can be difficult to dislodge. Try to locate the object if you can. Prying a jammed disposal with a broom handle or another similar object is not a good idea. 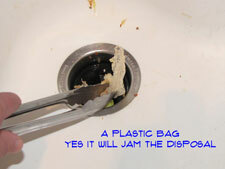 See the article 'Using a Garbage Disposal Wrench' for the best method on freeing up a jam. I'm not sure whether using a broom handle to free a jammed garbage disposal is a last resort or creative thinking. If you don't have an allen wrench and it is too late to go out, it is creative thinking. If all else has failed then it is a last resort. I do not believe that a broom handle will generate much more force than the allen wrench and a pair of pliers would. If it makes you feel better, try it. At this point, you may be faced with a tough decision. Assuming you cant' free up the motor and you cannot find an object that can be removed, you may be faced with replacing your disposal. Try one more time with the allen wrench to worry it loose. Still stuck? I feel your pain. A new disposal will run between $75 and $200. The difference is for power, features and whatever else they use to get you to spend more. It will take an hour or so to replace. Hopefully you have been able to unstick your stuck disposal. Most of the time you can use the special wrench that came with the disposal or use an allen key of the same size. 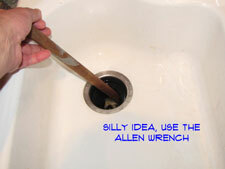 Working the disposal back and forth with the wrench will fix the problem most of the time. Ninety percent of the time the allen wrench will take care of the jammed garbage disposal in less than ten minutes. You may have been unfortunate enough to have a more serious problem. Just remember, if it was hard for you it would have been hard for a repairman. Worst case you had to purchase a new garbage disposal. Hopefully, one way or another you were successful. Now that you are done with your jammed garbage disposal you can consider your next course of action. Climbing the worlds seven tallest peaks is worth a look.